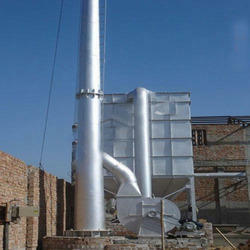 Being a customer focused organization, we are engaged in offering Industrial Chimney. The offered chimneys are designed and manufactured under the close supervision of quality analyzers to ensure their high strength. Our chimneys are widely used for purpose of venting hot gases or smoke from boilers in varied industries. In order to meet the customers' requirements, we offer these chimneys in varied sizes and designs. We are highly reputed manufacturers of premium quality Industrial Chimney. These are manufactured using the best quality of raw materials as per the clients furnished specifications. Chimneys manufactured at our facility are known for being sturdy, durable and resistant to damage. These are supplied to clients within the stipulated time period at affordable prices. These chimneys are manufactured in various lengths and are supplied to clients within the stipulated time period at affordable market prices. These are rust-resistant and weather-proof. Looking for Industrial Chimeny ?